Back then I even made a prediction that these notes would be worth $25 each in 2016. Boy was I wrong, lol. It’s now been about 3 years since I purchased my investment. Here are some recent ones that actually sold on eBay within the last day! The Zimbabwe currency was abandoned by most people in 2009. Since then the country has stopped printing the currency, and consumers have been using the U.S. dollar and the South African Rand to conduct financial transactions. Last year the government decommissioned the Zimbabwean dollar completely and anyone who still had some could exchange it for American dollars at the official exchange rate set by the government: $1 USD = $35,000,000,000,000,000 ZWD, lol. A long time reader recently asked me about it, so I thought I’d share my views. Initially the Zimbabwean dollar was worth more than the U.S. dollar at 1 ZWD = 1.47 USD in 1980. But the $ZWD quickly began to lose its value. Inflation rose to 32% annually by 1998. Hyperinflation was out of control by 2008 at 11,200,000% annually, Ay Caramba! 😯 Finally in 2009 the Zimbabwean dollar was suspended indefinitely. Today, the country officially uses $USD, €EUR, £GBP, and the South African rand as acceptable currencies. I bought some $100 trillion Zimbabwe banknotes on eBay in 2012 for only $4 CDN each! But since Zimbabwe banknotes are no longer being printed, finding them is becoming difficult as the currency becomes more rare which ironically is sending its value back up due to shortage. I bought more in June 2013 at approximately $5 each, including shipping. A few months later in October Anne from Unique Gifter mentioned these $100 trillion notes were selling for $6 each. Finally I checked once more earlier this year, 2014, and the cheapest ones I found were selling at $9 each. Goodness gracious. Look at that trend! I’m making a higher return (percentage wise) from these Zimbabwean dollars than from the stock market! I predict these same notes will be worth $25 each in a couple more years 😀 Financial independence, here I come! Below is a picture of some $ZWD banknotes I purchased last year. Guess what I found on Ebay. Money! But not just any money. It’s a 1923 one dollar bill. Spent $30 but I think it’s well worth it (゜∀゜) I scanned both sides of it below right. Click to enlarge. The face value is a dollar, meaning worth the same as a loonie if I decide to spend it. 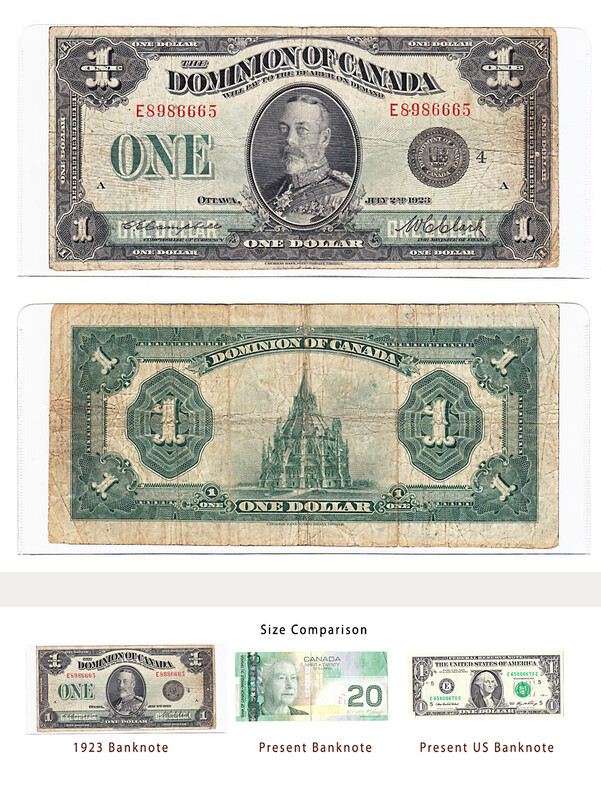 But back in the 1920’s $1 could actually buy approximately $13 worth of stuff in today’s dollars. Interesting to see the effects of inflation over many decades. The market price of this banknote today is $38 according to one banknote pricing guide online. Since its value appreciates faster than inflation, this banknote is sort of a long term investment in a way 😀 Returns aren’t great but at least it’s tax free.